Naskatucket is the oldest operating cemetery in Fairhaven. When first laid out in 1797, it occupied three-quarters of an acre in East Fairhaven, on the south side of what is now Huttleston Avenue (then Washington Street), east of Mill Road. It was divided by a north-south walkway, with sixteen lots on each side. A third of the acreage was set aside for the burial of the poor and strangers. It was enlarged to the rear twice by 1910, and in 1965 the Association purchased twelve acres to the south from Theodore T. Agnalt. 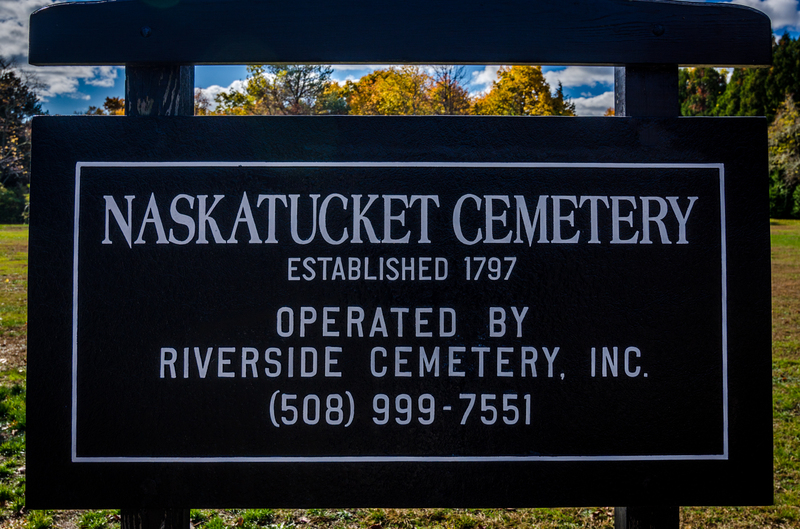 The cemetery was run by the Naskatucket Cemetery Association, incorporated in 1888 “for the purpose of acquiring, holding, managing and perpetuating a place for the burial of the dead.” It is currently operated by Riverside Cemetery, Inc. The oldest marked graves at Naskatucket belong to two children: the infant son of Captain Levi Jenney, who died in April 1797, and Nathaniel Hathaway, who was two and a half when he died in September 1797. Many members of the Hathaway and Jenney families were buried there between 1797 and 1957, as were Delanos, Blossoms and Howards. Operated by Riverside Cemetery, Inc.